The Xia-Shan covered market is an ideal location for a mixed-use and transit-oriented development that expands the green space network from the northwest hillside park. These approaches are described in the Transit Oriented Development and Urban & Green Space Development sections of the TDE Research and Strategy Report. 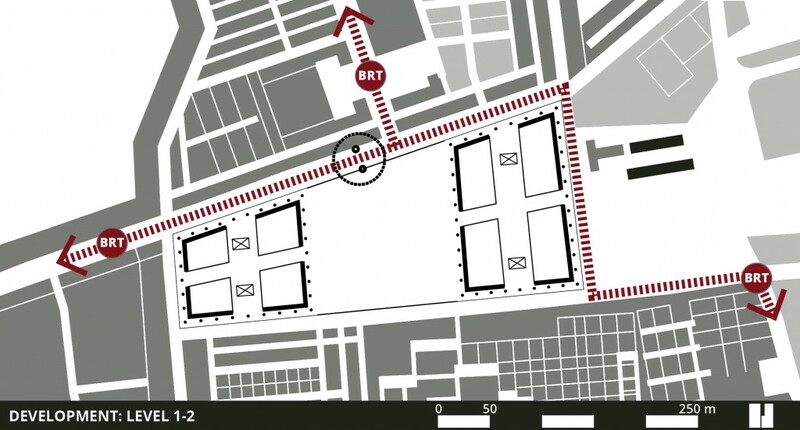 The existing market can be relocated to the recently built market district, just north of the covered market, with more modern facilities and improved infrastructure. The proposed development provides a significant activity centre (node) that helps to establish sense of community as well as sense of place. This project will also serve as a catalytic development to revitalize the surrounding neighbourhoods. 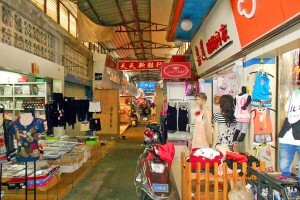 The Xia-Shan covered market is the heart of one of the many busy sub centres of the Shan Nan Desakota area. The covered market, not so long ago ahead of its time and a symbol of improvement and prosperity, is now derelict and in the way it is used, a very dangerous place for shopping and doing business. 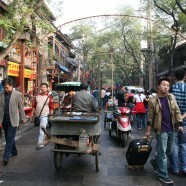 The abundant use of scooters in the narrow alleyways and the highly inflammable textiles in the market stalls is a hazardous and lethal combination. As the covered market is centrally situated in town, this location could become, as an alternative, an example of a multi-modal transportation network, incorporating pedestrian, bicycles, Bus Rapid Transit and a metro. This metro, running underground in dense urban areas, connects Xia-Shan with other sub centres and cities in the region and, ultimately, with the City of Shantou. The metro station in central Xia-Shan could become one of the nodes where metro and Bus Rapid Transit interlink, as already suggested in the TDE Research and Strategy Report. 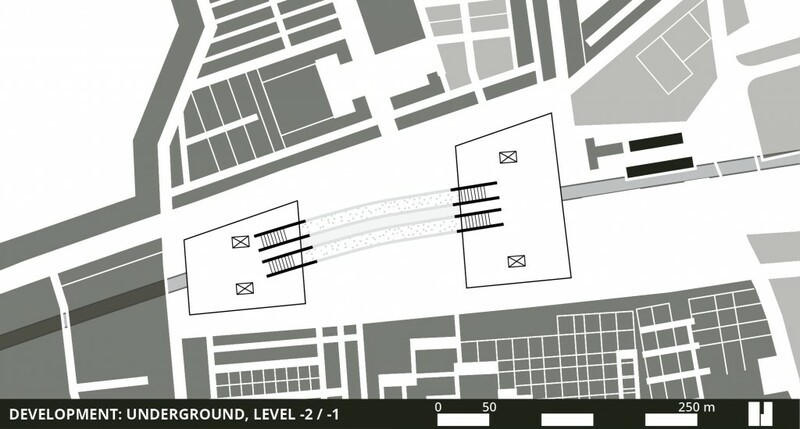 The construction of an underground metro station requires quite some space. This justifies the complete urban block that encompasses the covered market to be demolished and relocated. The space that remains after demolition is a large open area. The platform of the metro on level -2 connects on ether side via stairs, escalators and elevators with large parking spaces for bicycles and scooters on level -1 and with two arcaded shopping malls on ground level (level 1), office space on level 2 and apartments on levels 3-6. 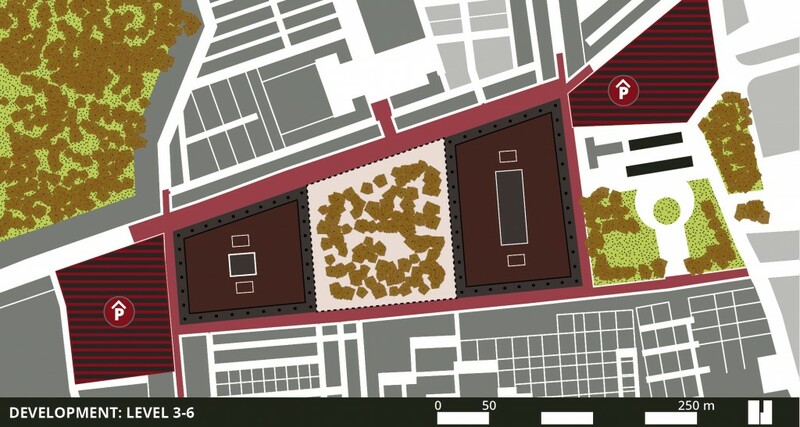 In between the two new building blocks a public and green square is projected. The (underground) metro in combination with Bus Rapid Transit and parking places for bicycles and scooters only, must ultimately lead to a public space where is only very limited access and place for cars. It will be difficult enough to adjust the present urban fabric and streets of Xia-Shan to the requirements of Bus Rapid Transit that requires free bus lanes. 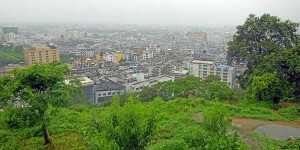 Even when the exploitation of a metro line under passing and stopping in Xia-Shan is not feasible, it is worthwhile to aim for Bus Rapid Transit only, providing that there is a large parking place for bicycles and scooters and that the quality of the urban public space is much improved. The proposed metro station in the centre Xia-Shan primarily connects with Bus Rapid Transit, bicycles, scooters and pedestrians. Although metro stations in between the existing city centres are more suitable for building parking garages for travellers stepping over to the faster metro lines, the development of one or two parking garages nearby the metro station in XIA-SHAN could be considered. 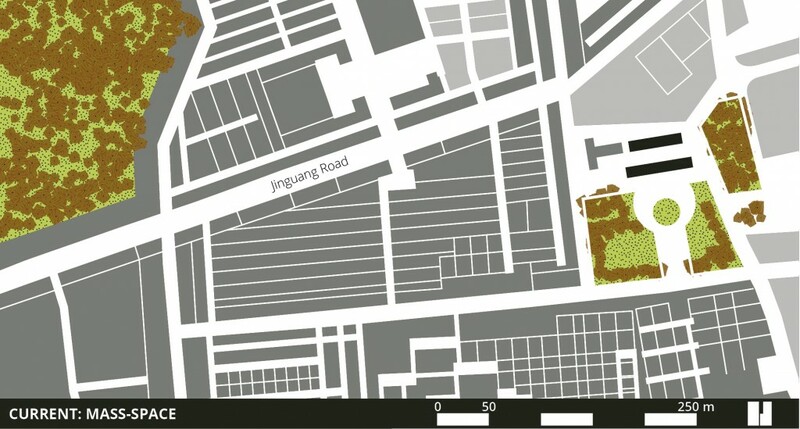 The redevelopment of the Xia-Shan covered market into a metro station is a strong catalyst for urban renewal and for urban transformation in a wide area around the new metro station. The new metro station will improve and upgrade business opportunities in a radius of at least 1.000 metres around the metro station. This will have a positive effect on the value of real estate, shopping spaces and office spaces within that radius and beyond. A key success factor of Transit Oriented Development is that the direct environment of metro stations provides opportunities to connect with other modes of public transport, like the Bus Rapid Transit, and that there are abundant parking spaces for bicycles and scooters. Above all, it is very much important to improve the public space in the streets leading towards the metro station within the radius of at least 500 metres, making the public space around the new metro station into a car free area that is focussed on pedestrians and slow traffic.